Ink Web Solutions is a leading IT solutions provider company offering WordPress Design and Development Services including WordPress web development, PSD to WordPress Conversion, WordPress theme development and WordPress fashion blog development. To customize an active web portal and a PSD file, a PSD to WordPress conversion is regarded the best solution. It involves converting PSD to XHTML and XHTML to WordPress. Ink Web Solutions, a leading web development company from Hyderabad is an expert at PSD to WordPress coding and had handled several PSD to WordPress conversion projects recently. WordPress is a popular PHP and MySQL powered open source state-of-the-art publishing platform that can build weblogs or websites. It is a blog publishing and web publishing application that is easy-to-install and easy-to-upgrade. WordPress's open source blog publishing application is used to manage websites. Ink Web Solutions has the expertise, respurces, experience and technology to convert PSD to WordPress template through specific frameworks. We are the best PSD to WordPress CMS service as our PSD to WordPress conversion services focus on high quality, quick turnaround time and prompt response – all aimed at 100% client satisfaction. 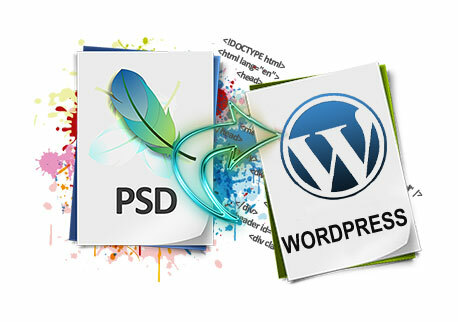 Ink Web Solutions offers PSD to WordPress conversion services at a highly affordable cost. We can handle the PSD to WordPress theme/template customization and integration and provide a high-quality WordPress powered website. Our team of WordPress developers can convert your format designs such as BMP, PDF, AI, PNG, TIF, PSD, GIF, JPG by integrating or customizing it with WordPress theme and templates. All WordPress themes are templates are ensured that they are standard compliant and cross browser compatible. We are champions and can convert html to WordPress, PSD to WordPress – in short, we offer WordPress conversion services and can launch you into a world of WordPress eCommerce. Chandigarh's Leading PSD to Wordpress Conversion Company ! Ink Web Solution provides PSD to Wordpress Conversion services in Chandigarh, Mohali, Himachal Pradesh and India. Ink Web Solutions is the #1 company for PSD to WordPress conversion service, because we deliver best results for affordable costs. Our experienced coders learn how to optimise WordPress for your themes, so it seamlessly works. We've modified a large number of PSD to WordPress web templates for clients over the entire years. Nobody is better than us to provide a higher performance website developed on WordPress.